Working on ReVuDo for Nozbe in my spare time means that I rely on you to help with finding all the bugs. Many thanks to George for reporting that I broke printing in version 0.4. ReVuDo 0.4.1 corrects that. 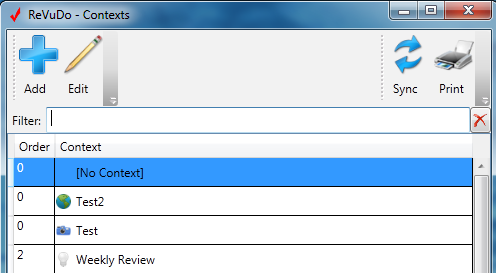 In addition to this bug fix, take a look at the new Contexts window. 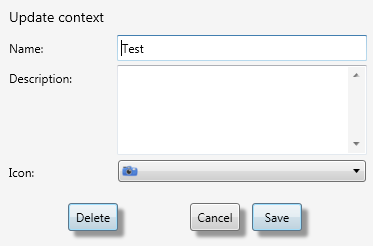 You can now Add new contexts to Nozbe from ReVuDo, Edit existing ones, or Delete them (from the Edit Window). Now you may be wondering why contexts and not projects or tasks. I had to start somewhere to work out the details of updating Nozbe, and contexts were the simplest thing. Only a name, a description and an icon. With that worked out I will now turn to projects and tasks for the next update. I’m excited to have this first part of editing Nozbe working and can’t wait to have the rest added so I can move to adding even more features. Thanks again to George and everyone else who have helped me along the way! Download ReVuDo 0.4.1 and let me know what you think! Michael, thank you for fixing it!